A teenage boy and a woman have been arrested on suspicion of attempted murder after a man was stabbed in Manchester. 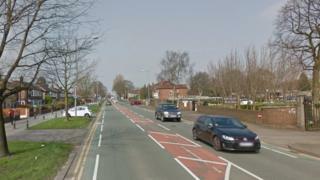 The man, aged in his 40s, was taken to hospital after he was found wounded in Barlow Moor Road, Chorlton, at about 06.15 BST. A 15-year-old boy and a woman, 32, were arrested and remain in custody for questioning. Mottram Avenue and the surrounding area was cordoned off by police. Greater Manchester Police is appealing for witnesses or anyone with information to come forward.